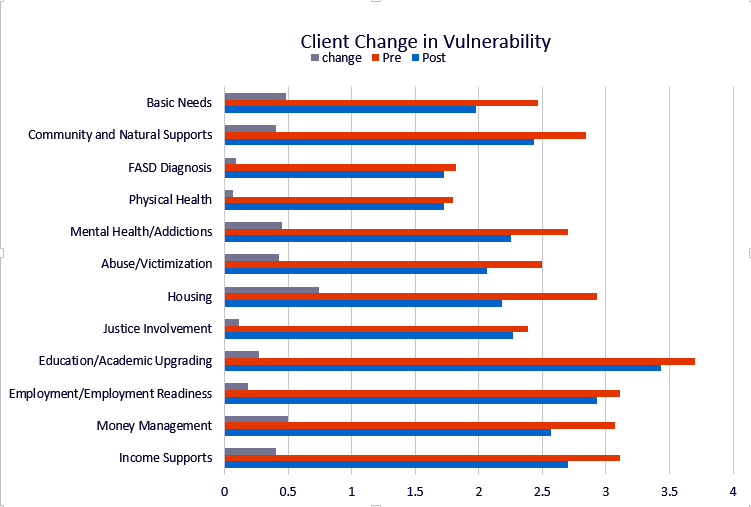 As mentioned in the Introduction, in 2016-17, our service partner programs providing adult supports implemented a new client survey that focused on 12 areas of vulnerability (see right) identified in the Best and Emerging Practices report. As well, these surveys included pre- and post-service data (or annual data if clients were not yet discharged) contributed by client caseworkers, giving CFAN a view to the impact of the adult support programs over one year. In 2016-17, 619 adults and youth were served through CFAN-funded FASD programs and 200 more attended a group program partially funded by CFAN. Individuals impacted by FASD have access to appropriate supports as required to reduce vulnerability and facilitate greater community inclusion. Pre-service data in the caseworker responses identify Education/Academic Upgrading as the highest level of vulnerability, followed by Income Supports and Employment Readiness, then Money Management. Lowest levels of vulnerability are Physical Health and FASD Diagnosis. Post-service data indicate that as a result of service, adults experienced a reduction in vulnerability averaged across all 12 areas of 27%. The data also show that as a result of service, the largest improvements are in the areas of Housing, followed by Basic Needs, Mental Health/Addictions and Abuse/Victimization. (My caseworker) helped me to not get out of control. (This program was) especially helpful after a bad bike accident! I’ve now been housed for 1.5 years! They helped me get lots of supports in place. (My caseworker) kept me on track. (This program) helped me with many legal issues. Survey data indicates a 92% satisfaction rate with clients' role in deciding on the kind of supports they received from CFAN-funded programs and 94% satisfaction rate with the services provided.